And you thought you knew all of the world's weirdest watering holes. From a pool hall named Bin Laden's Cave, to a wholesome neighborhood eatery dubbed Bin Laden and Family, a curious trend's taken hold in Brazil: bars and restaurants themed after the world's most notorious dead terrorist. Which leads us to wonder, What the hell is wrong with you people?! Apparently, there are a dozen places embracing the controversial theme across the country, according to Vocativ, including a number of bars frequented by Bin Laden doppelgängers. One spot in the town of Juiz de Fora, Bin Laden's Bar, actually changed its name (and now sells ironic BL apparel) after local college students noted the owners' uncanny resemblance to the bearded one. There was even a former car parts shop called Bin Laden's Bombas -- although why they named their shop after these mind-blowing athletic leisure socks is anyone's guess. Amid all the Bin Laden madness, though, one bar rings loudest. Bar do Bin Laden, a rock joint smack dab in the midst of this Summer's World Cup festivities in Sao Paolo's Anhangabau district, has an owner who looks just like Public Enemy #1. Rather than shave his thick beard or duck the issue post-9/11, Ceará Francisco Helder Braga Fernandes decided to capitalize on his resemblance and, according to the Guardian, renamed his bar following the attack. Seriously, do we have to ask again? The popular spot's filled with photos of Francisco posing with customers, including ones as famous as Brad Pitt, apparently, and even boasts its own local Obama double. 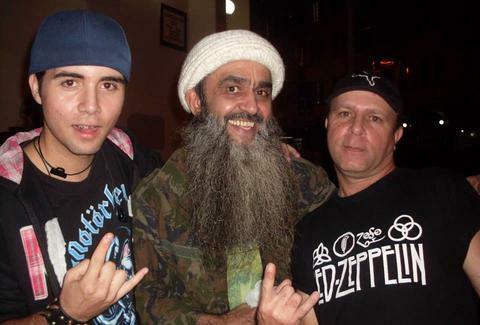 Here is Brazil's fake Bin Laden encouraging one of his patrons to chug a beer after (weirdly?) brushing the hair out of her face. Chloe Pantazi is an editorial assistant on Thrillist's travel team. Follow her to the Vladimir Putin vodka bar on Twitter at @ChloePantazi.